Beautifully engraved certificate from the Warden's Office issued in 1856. 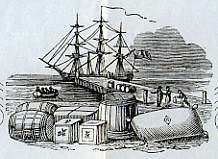 This historic document was printed by T. and G. Town Printers and has an ornate border around it with a vignette of people rolling barrels on to a ship sitting in a harbor. This item is hand signed by the Company's Master Warden ( Heurman Yerkes )and Secretary ( Thomas Metts ) and is over 147 years old. 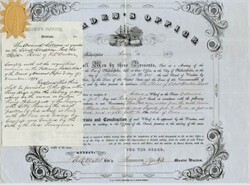 The certificate approved construction of a pier for the heirs of Robert Buston.